With frevvo, you can already generate a PDF when your workflow is submitted. The PDF looks like the form on the screen. But customers want to use the data to fill in their own PDFs or government PDFs like the US W-4 form. We’re working on this and it’ll be available in the next release. Together with electronic wet signatures, it’ll be easy to fully automate workflows like Employee On-boarding where you can collect employee information and a signature electronically and generate all the required documents. We’re still working out a detailed design but one possibility is to drop a PDF activity into your workflow at the end. 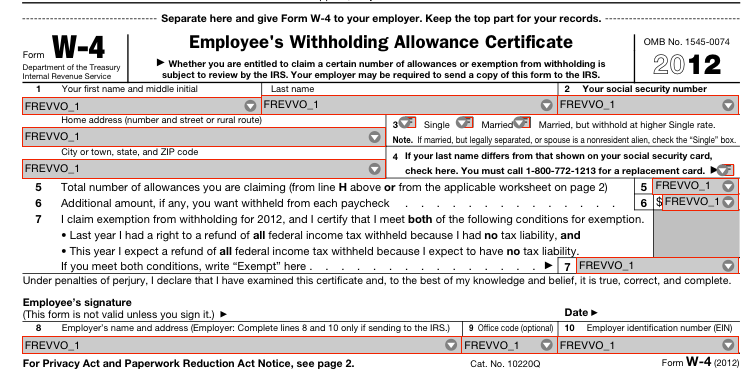 After you upload your PDF, frevvo will send you back a modified PDF as shown below for a US W-4 form. Notice that all the fields on the PDF have been replaced by pick lists. Each pick list contains the currently defined fields in your workflow and you can map the fields from the workflow to the PDF. Once you are done, upload the mapped PDF back to frevvo and it will take care of the rest.